Shelby's Elbows original wrote this Christmas track back in 2011, as part of a special festive performance at the Howl Open Mic Showcase, held at the River Cottage Canteen in Axminster. A year later, they released a full version of the track. 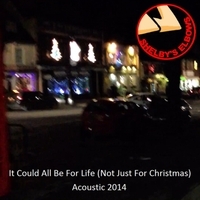 Now, in 2014, they've re-released the track again, this time with a cut-down acoustic flavour. For many, the meaning of Christmas has become blurred. With the financial burden and third-party advertising pressure inflicted on us every year, it's easy to forget that Christmas is supposed to be a time of celebration, family fun and compassion. But this isn't a negative song - 'we all pray for snow but it never comes down, yet still we all know that it's Christmas somehow'. Behind all the unnecessary stress, it is still there, we just need to claim it back.